Many people love Instant Noodles. Not only are they cheap but more importantly, they are quite good. And while its a relatively "new" thing to the western world (10+ years) its been in the Asian culture for closer to 30+ years. The problem is that there are so many different kinds of instant noodles and I'm sure everyone has their favorites. Noodles from China, from east asia, from Korea, from Japan the list goes on. The kind of noodles that I'm addicted to are called Mi-Goreng (Fired Noodles). Instead of soup its served dry or as close to fried as instant noodles can get. Just boil the noodles, put all the additives and spices that come with it in a bowl, drain the noodles and put it in the bowl with the dry stuff and mix. Viola. Its ready to eat. 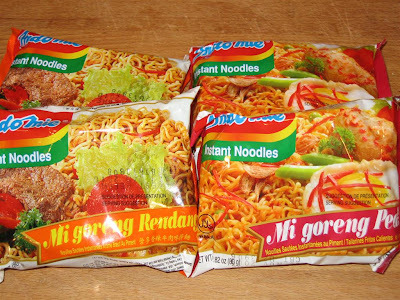 If you're in the United States then chances are none of the major grocery stores carry this brand of noodles. Check out United Noodles, its a major asian grocery store in Minneapolis and you can order it online. 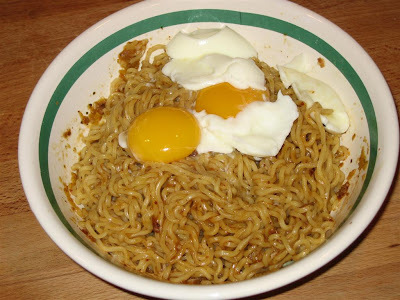 2 Packets of Instant Noodles and 2 three minute eggs on top and I'm in nostalgia heaven. The perfect midnight snack or early morning breakfast. Watched this today and I was pretty excited. The trailer made it look awesome and the thought of monsters saving the day had lots of potential. Its no secret that Pixar has been the company to beat in the animation scene. No one makes an animated movie like Pixar does. Although effort by other companies were getting very good and the first non-Pixar animation movie that blew my mind was King Fu Panda last year by Dreamworks. 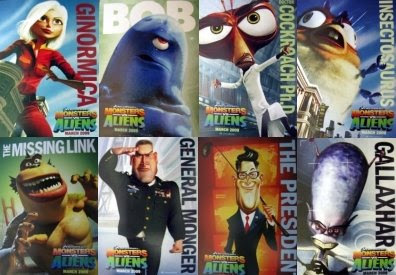 And now they are releasing Monsters vs Aliens. I won't go into specifics or detail the plot, you can get there anywhere on the web or at the wiki page. Is the movie good? Yes. If you have a kid, go watch this its gonna be tons of fun. Is the movie great? No. Its a good animation movie, but its not quite Pixar or Kung Fu Panda level. The reason might be the story, there are some parts that drag a little too long. 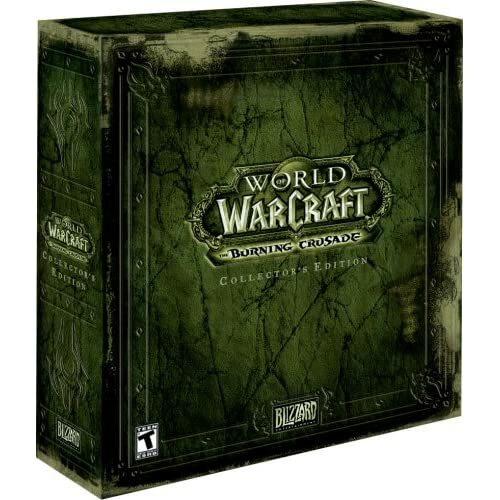 And as for the voice acting, it was again good but not great. The real acting in an animation has be the cohesion of both the actor's voice and on screen cartoon personality. We saw this first hand in Kung Fu Panda where Jack Black WAS the Panda. Reese Witherspoon just doesn't have that kind of a voice. In fact the best character in the whole show was B.O.B aka The Blob aka Seth Rogen. I dare you not to laugh when he opens his mouth. All that aside its worth watching at the cinema, and definitely a dvd rental or purchase. Oh and there's an added benefit that some cinema's are showing this in 3D. Personally, I've never been impressed with 3D technology so its not a huge thing for me. 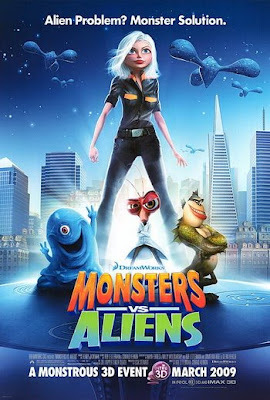 I rate Monsters vs Aliens an 8/10. Good but not great. For all the talk out there about how bad the economy is, it's never quite as true until it hits you personally. 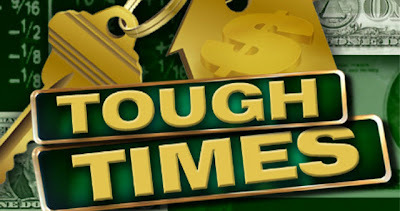 Well, I found out today that all employees in my company will be taking a slight pay cut effective April 1st. I work for a very large Indian corporation, actually I work for an american company that was bought over by an Indian corporation. And as far as I know its affecting everyone. My own pay will be lighter by 5%. Its not much and its a heck of lot better than being laid off. But it just might be time to cut down those daily coffee trips to the caribou coffee. I had a hankering to eat Beef Sukiyaki last week. In case you don't know Beef Sukiyaki is essentially a slightly sweet savoury stew of very thinly sliced beef and onions. And it goes so well over rice. I made this dish before but it just wasn't right. The real trick is making sure the beef is thinly sliced. As thin as you can manage, and the trick to that is to put the beef in the freezer for about 2 hours then slicing it. This try turned out very well. Its still not quite as thin as japanese shops have it but then again they might use a machine to cut the beef and I'm not spending $100+ on a slicing machine. I bought Flank Steak cut of beef and put it in the Freezer for 2 hours. So its cold and holds its shape without being even close to frozen. This made cutting thin slices much much easier. The good news is that cutting the beef is the hardest part of the job. I next fried the thinly sliced beef in batches to ensure that they were all cooked properly. I used olive oil for frying, and pan fried them to about slightly pink and releasing some of its juice and put the cooked beef in a bowl. 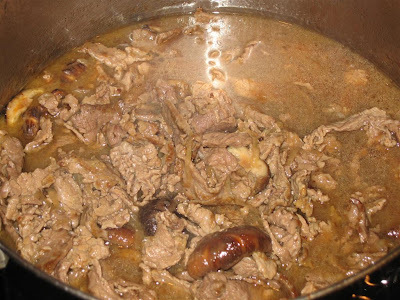 After about 3-4 batches (all beef slices cooked), I cooked the onions till yellow and soft (about 5 mins), Add in mushrooms, then added all the cooked beef and all the liquid into the pot. Next bring to a bowl and taste. If there is too much liquid, you can simmer it down. 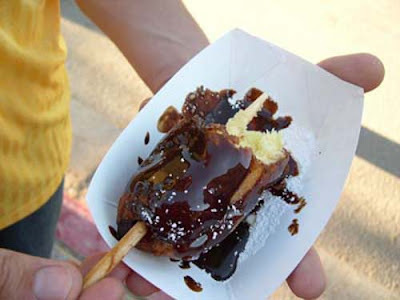 The Mirin sauce removes the need to add sugar. Beef-Sukiyaki is slightly sweet. The ending sauce might be a bit salty but that's ok. When poured over steamed rice its excellent! 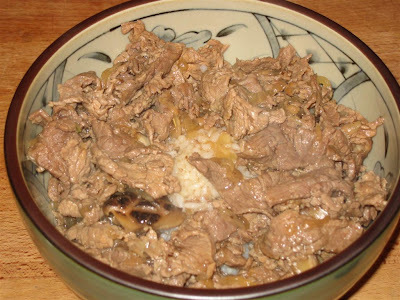 Japanese Sticky rice would be best for Beef-Sukiyaki but jasmine rice works just as well. Mamma Mia by Dawn French as Julie Walters, Jennifer Saunders as Meryl Streep (hilarious) and Joanna Lumley aka Patsy as Christine Baranski with Sienna Miller as the daughter! I think its funny as heck, the comics are from the hit british comedy Ab Fab. Stressed? Just watch this clip of a cat cleaning a fox while holding him in a headlock. I'm not talking about new TV series shows, that usually happens in the fall. But this weekend end we have a treat, popular novels are being made into TV shows. 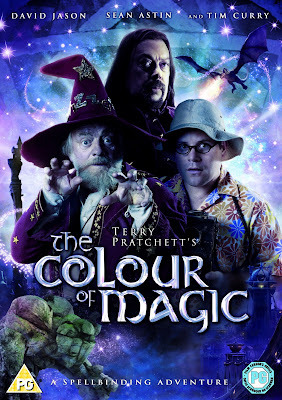 Terry Pratchett's The Color of Magic will air this Sunday. Should be fun, its a Discworld book. If you don't know that world, its full of magic and witch's and dragons. Also, Discworld is a flat world balanced on the backs of four elephants which, in turn, stand on the back of a giant turtle. And if that brand of humor appeals to you (which it does to millions of readers) we should be in for a treat. 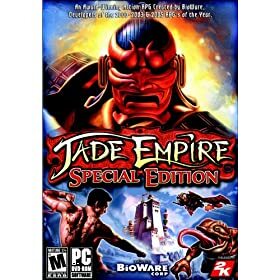 Actually this was created in the UK and was shown there in 2008, so there's a chance it might be on DVD in some parts of the world. 4 of Nora Robert's books got turned into Made for TV movies in 2007. Carolina Moon, Blue Smoke, Montana Sky, and Angels Fall. For 2009, we are getting another 4 books turned into movies, Tribute, High Noon, Midnight Bayou, and Northern Lights. Nora's books are almost always on the bestseller list. They are always more about character studies, and focus on people which make them very suited for a TV movie. Tonight is the premiere of Northern Lights on Lifetime starring Eddie Cibrian and LeAnn Rimes. 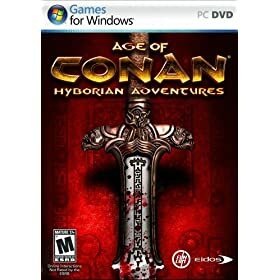 I'll admit that the first 4 movies in 2007 were ok. They were made for TV and as such quality/acting etc was so so. This time round however, I think much more money is being poured into the movies as evidenced by the cast, some of whom are almost A list stars. Like Eddie Cibrian, Jason Lewis, and Brittany Murphy. So for fans of romance and Nora Robert's, its gonna be a great 4 weeks. PS. Did I mention that I absolutely love their choices for leading men for these 4 movies? Well its not news that many people are out of work, but as a consultant, having some months of the year off between assignments is fairly common. I finished up my last assignment in Pittsburgh the day after New Years, took about a month to visit family in Singapore and have been 'on the bench' for the past month. So I started work with my new client today which is great. Even better, its an in town assignment so no traveling is involved. The only real down side? 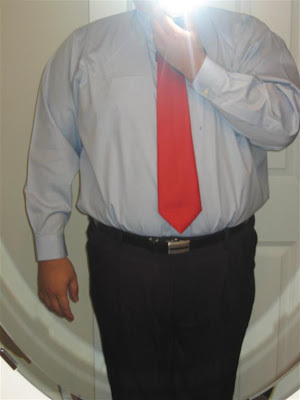 The company requires a formal dress code. That means long sleeve shirts and ties. I've not worn a tie in years and it took me a full hour to remember how to knot a tie correctly. Also, I own exactly 2 suit, both of which don't quite fit anymore and since I'm not willing to purchase a new one, I'm not wearing a suit. Only a tie to work. Which works out because even with formal wear, only about 50% of the folks actually wear a proper suit. Although I'm gay, I'm not fashionable or much into clothes. But thankfully I do have about 3 brand new dress shoes that I bought previously. Just never got the chance to wear them. 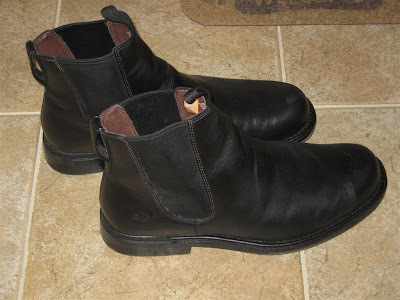 Below, are a pair of low rise leather boots which I fell in love with about 3 years ago. I'm finally taking them out of the box. I found an interesting website. 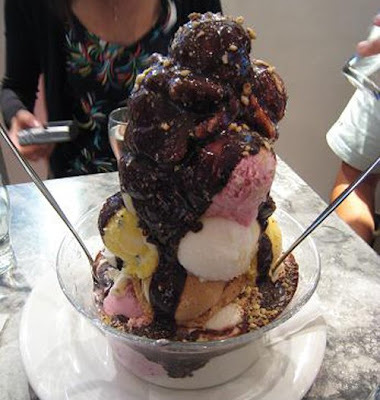 Basically its called This is why You're fat. Below are some choice pictures. 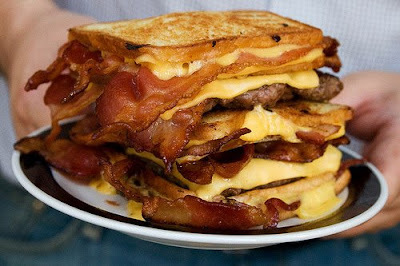 Three bacon-stuffed grilled cheese sandwichs for buns, cheese, bacon and two four-ounce beefs patties. 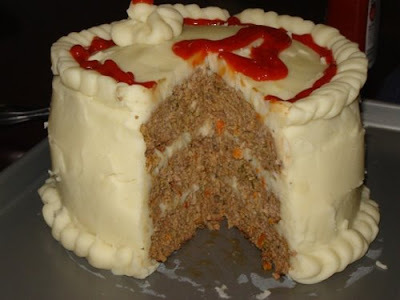 Meatloaf with potatoes and ketchup for icing. 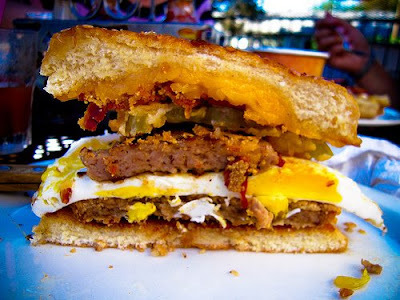 Chicken fried steak, chicken-fried bacon, a country sausage, a fried egg, a fried green tomato topped with cheddar cheese and sandwiched between buns toasted in bacon fat, all served with a gravy dipping sauce. This is a very difficult show to review. Why? Because it depends on the viewer. If you've never had an interest in superheroes or comics or manga, I would highly recommend that you skip this show, it's just not for you. 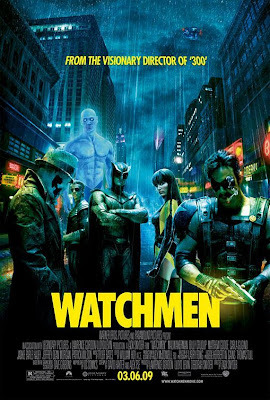 However, if you like comics then you probably already watched this movie. The director was very true to the 1980's comic book story and it is a very good story for a comic/graphic novel especially since it was written in the 1980's. The show is a little long, and don't expect a rip roaring action packed movie like Ironman. This is a cerebral comic book, for the intelligent geek. Personally, I liked it enough to give it a 8.5/10. 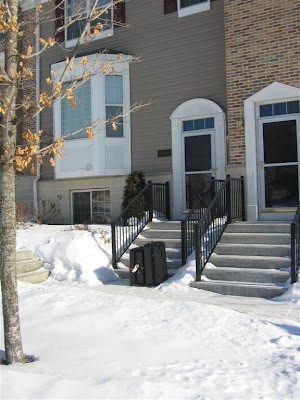 This is a picture of the house when I arrived back from Singapore. 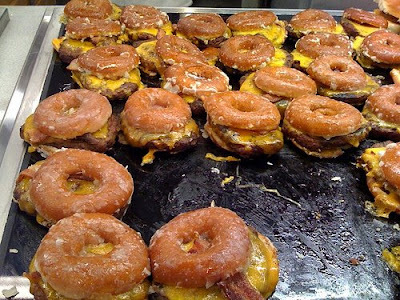 This is the first meal I had after I arrived back in Minneapolis. 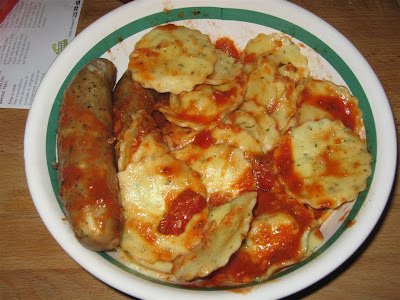 Pasta, sausage, and sauce. 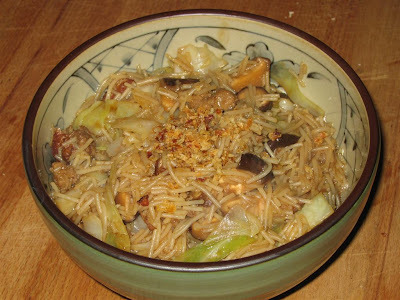 Here's some noodles with cabbage, mushrooms, stewed pork and ground turkey. 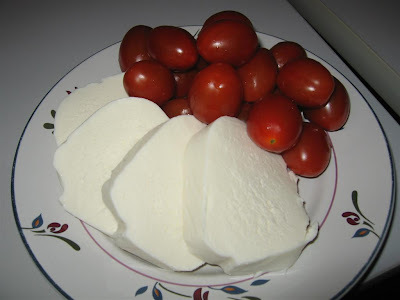 I'm currently in love with Fresh mozzarella with grape tomatoes. I love a western breakfast. 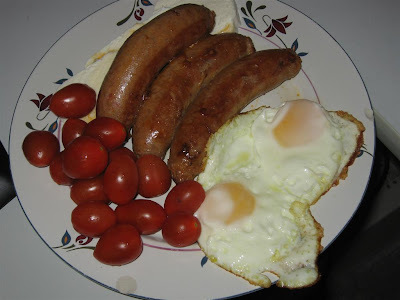 Sunny side up eggs, sausage and tomatoes. 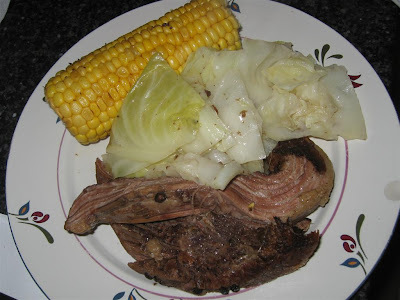 And here's when I made corned beef and cabbage. 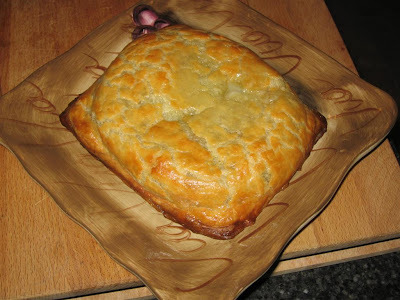 Here a frozen chicken pie, it was from costco and actually quite good.